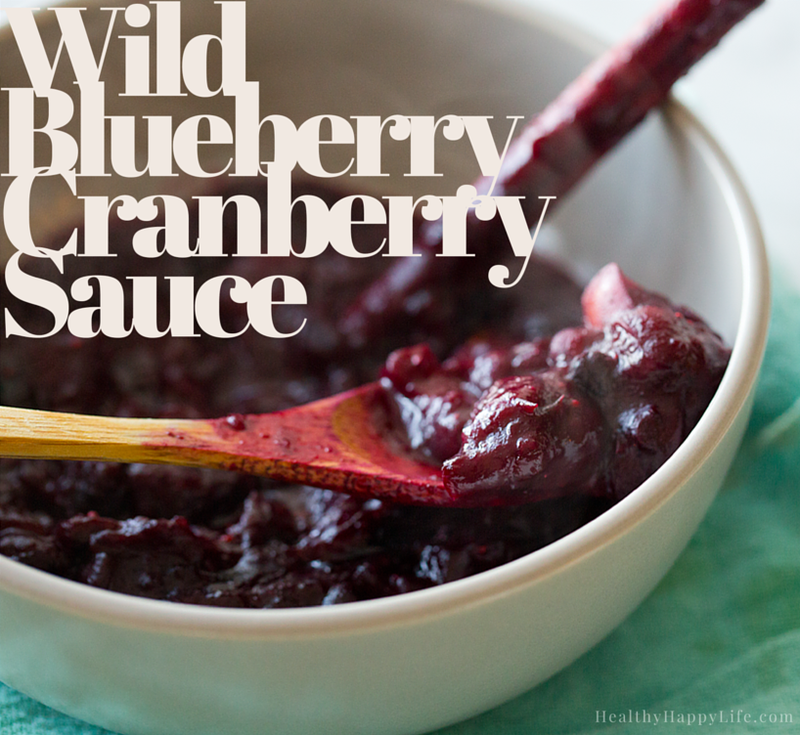 Wild Blueberry Cranberry Sauce. With Apple, Citrus and Cinnamon. Tastes Like Pie. 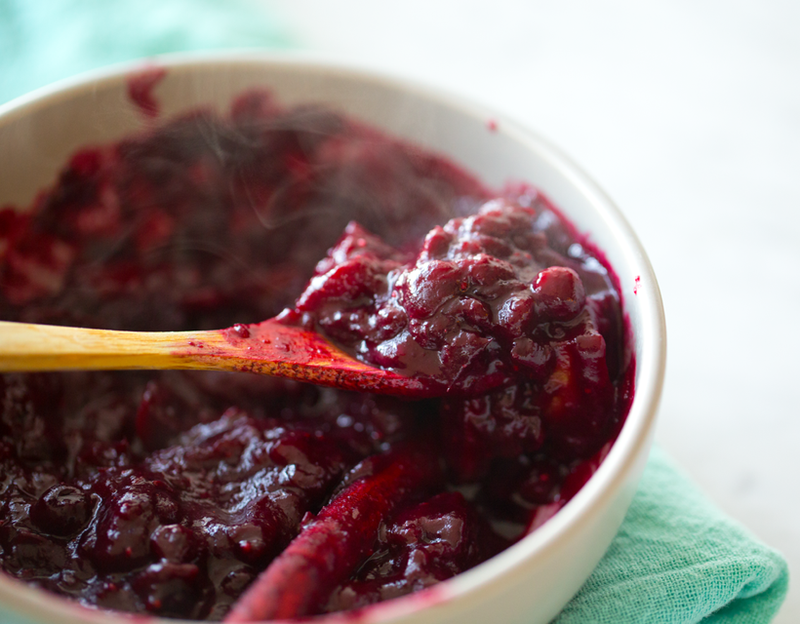 This deep purple, dreamy, magical cranberry sauce turns everything up a notch for your holiday (or any day) table. My Wild Blueberry Cranberry Sauce is brimming with dark berry goodness - accented with citrus, apple and cinnamon. The flavors and texture are reminiscent or a luscious, gooey, sticky-sweet, tart berry pie filling. The flavors are sweet and zingy, perky and bright. You can serve this sauce warm or chilled. 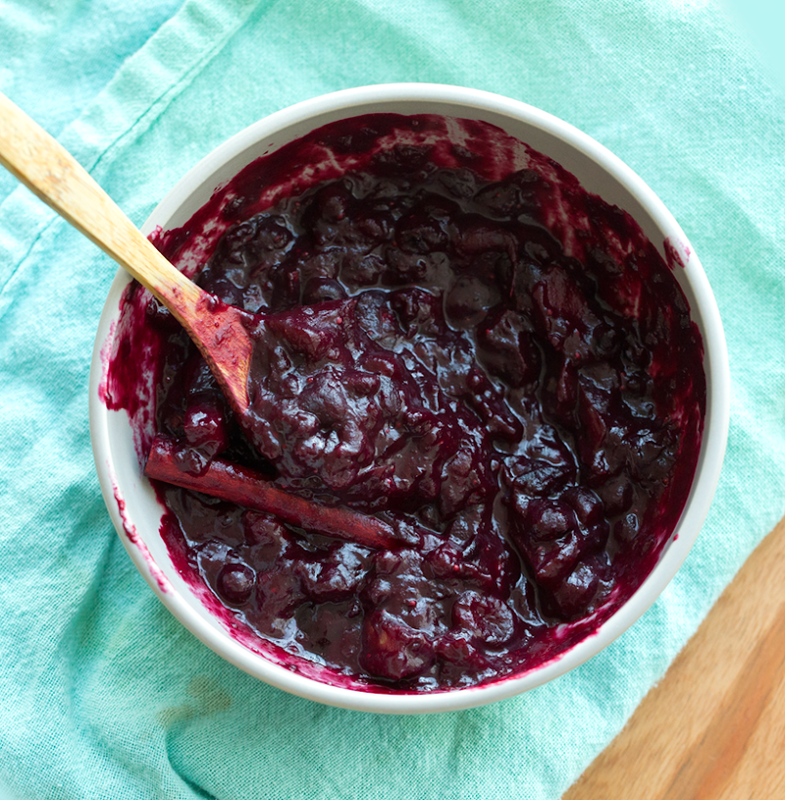 The blueberries and apple mellow out the usual zingy flavor of cranberry sauce. Spoon dive into this side dish!.. Jellied version, aka blend until silky style.. 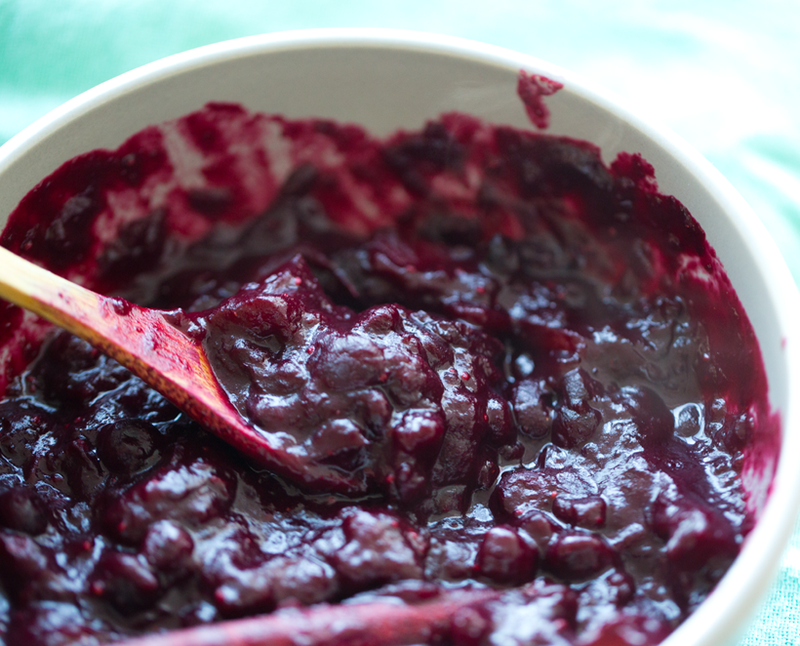 I was inspired to make a blueberry-cranberry sauce when I saw this recipe for Blueberry Cabernet Cranberry Sauce by fellow food blogger Averie. But I really didn't want to booze up my cranberry sauce. I know, I know, WHY in the world not?? Well, I just wanted to try this new-to-me blueberry-cranberry sauce thing on its own. And I am glad I did! I used organic wild blueberries from my freezer, added an apple and tangerine from my local farmer's market, a cinnamon stick and a few sweet add-ins and this sauce was born. I consider this sauce to be low in added sugar. Most cranberry sauces ask you to add one cup of sugar. But I tried to keep it to only 1/4 cup of raw coconut sugar - and it worked quite well. The blueberry and apple added an extra boost of sweetness. 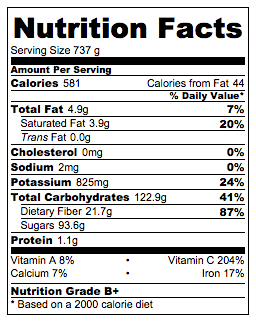 Pro-Tip: If you still think this (or any) cranberry sauce is too tart -- try adding an extra 1/4 - 1/2 cup of water. This thins and mellows everything out. And cranberry really does well in a thinned out state - because it is loaded with pectin, which is a natural thickener. And you guys already know this, but this sauce is SO good for you. 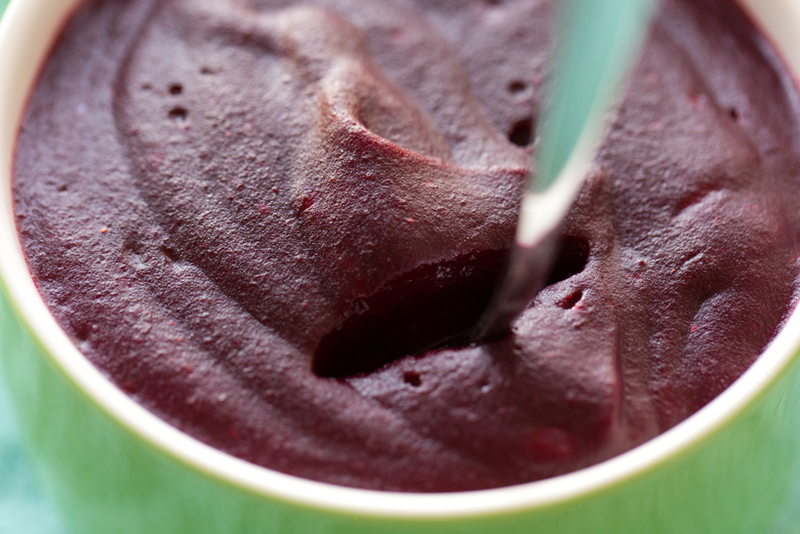 Rich in fiber and loaded with berry phytochemicals from all those deep, dark berry pigments. Blueberries, as you may already know are one of the healthiest fruits you can eat, so add in some cranberries, apple and citrus and you get a pretty nice nutrition boost to your meal. Creative Serving Ideas: This cranberry sauce tastes super yummy swirled into vegan plain or vanilla yogurt, or chocolate banana ice cream! It is also yummy slathered on a veggie burger or savory vegan sandwich. 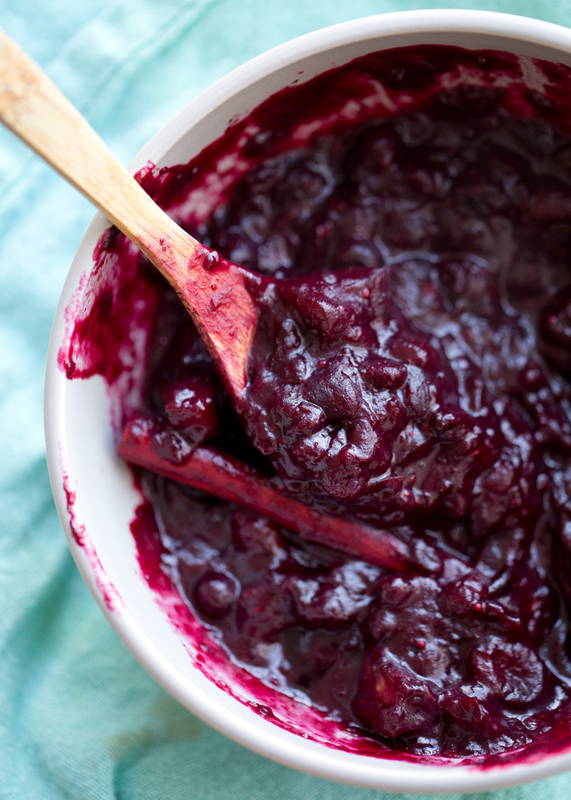 This rich and alluring cranberry sauce is accented with blueberries, apple and cinnamon. Super dreamy and flavorful. Perfect for the holidays or any day! Add all the ingredients (including the cinnamon stick) to a big soup pot and heat over medium-high heat, constantly stirring and mashing the fruit a bit. When the mixture has softened and thickened, turn heat to low. Transfer half of the mixture to a blender and blend from low to high until smooth. Then pour back into the pot and fold the puree mixture with the chunky mixture. If you prefer, you can keep everything chunky -- or puree the entire mixture for silky smooth sauce. Nutrition, for the entire recipe.. Need more holiday ideas? Check out my Thanksgiving Menu 2015!